Etihad Rail, the developer and operator of the UAE's national rail network, has made significant progress since its inception in 2009 and is set to complete the project as per schedule within next five years, according to a senior official. "Looking at stage one alone, construction is well under way, the sleeper factory in Mirfa is fully functional, and wagons have already arrived. 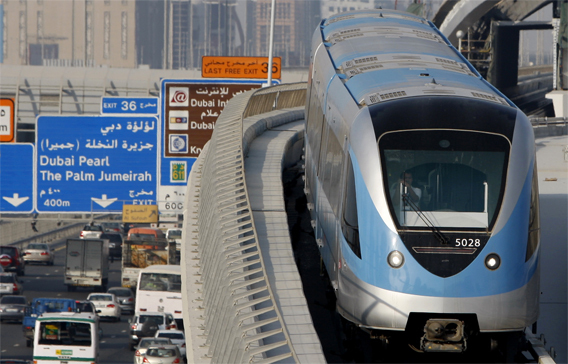 "Stage two to link trains between Abu Dhabi and Dubai will be in place by 2017," he said, adding that the 1,200 kilometre network is expected to be completed by 2018, when it will connect the rest of the network in the northern emirates. “Our locomotives also arrived in April 2013, and we are on schedule for the first train to run from Habshan to Ruwais by the end of this year," Shadi Malak, Executive Director of Commercial and Operations, Etihad Rail, said. This is just the beginning of a long journey as the Etihad Rail has big plans to connect the emirate to a wider international network from the Middle East to Europe and Asia in the long run. 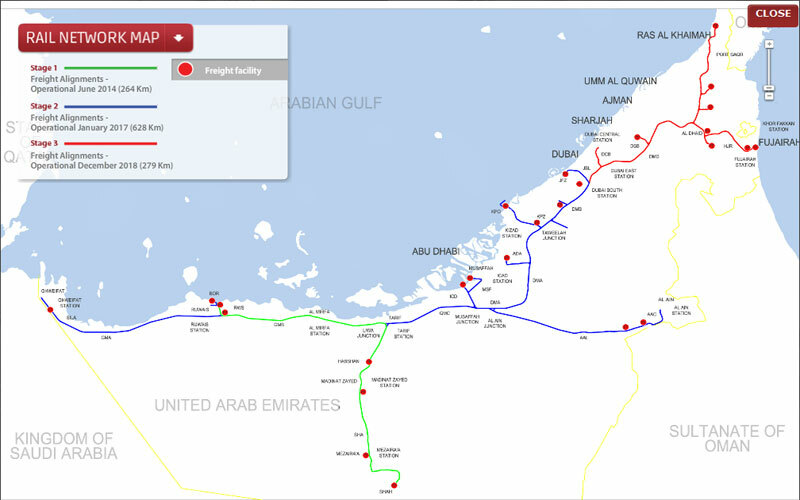 Initially, a three-stage $10 billion plan is under way that will lay down a 1,200km network to connect Abu Dhabi, Al Ain, Dubai, Sharjah, Fujairah, Ras Al Khaimah and Khor Fakkan by the year 2018. "Etihad Rail plans to operate some passenger trains between Abu Dhabi and Dubai once stage three is in place by 2018. “We have considered the possibility of another separate connection between the two cities," Malak was quoted by Wam as saying. In terms of stage two, which will connect the railway to Mussafah, Khalifa and Jebel Ali ports and extend to the Saudi and Omani borders, he said the tendering progress is currently in process. "We also have a rapidly expanding and diversifying customer base. To date, Etihad Rail has signed 15 Memorandums of Understandings (MoUs) with a number of customers throughout the Emirates in industries ranging from oil and gas and agriculture, to aggregates and waste, all of whom recognise rail as the preferred mode of transport for their goods." Malak said the UAE and Saudi Arabia have made ‘considerable progress’ in developing a rail network while other Gulf countries have also initiated work on mega-projects to link all their main ports and the Indian Ocean to transport goods to the rest of the world. He said that existing or planned national lines will either be part of the wider GCC network or have links to it. Each country is responsible for building its own segment of the GCC network, along with its stations and terminals. The construction phases will begin this year and the network is expected to become operational in 2018. "The GCC rail network is part of a wider GCC economic merger strategy, which in turn, reflects a certain will for political integration. It is an opportunity to test the six countries’ ability and readiness to cooperate and implement large-scale projects of strategic importance. Besides boosting trade, the rail network will connect all the countries of the GCC to the main ports of the Gulf and the Indian Ocean to transport goods to the rest of the world," he added. Malak said the GCC railway might include plans to integrate and connect beyond the GCC region, linking into other countries in the Middle East. Following a detailed feasibility study, this includes specific plans for connecting to the Yemen border. Other planned connections include reaching Jordan via the North-South Railway in Saudi Arabia, and Iraq via Kuwait. "Syria and Turkey are also target destinations, representing an important step towards a European connection. In the long term, this will include exploring the possibility of extending a link via Central Asia and China, as well as other dynamic Asian economies. Similarly, linking with Turkey’s rail network through Jordan will give GCC member states access to the European rail grid." Malak said the development of a national railway is part of the Federal Government’s UAE Vision 2021 to diversify the economy by investing in excellent transport infrastructure that capitalises on the UAE’s strategic geographical position, and Etihad Rail is a part of this vision. "Etihad Rail plans to launch passenger services in the future and will be coordinating closely with Department of Transport, Roads and Transport Authority (RTA) and other Emirate-level authorities to ensure close integration of urban and main line railway systems," he said. "The UAE has a long and proud tradition as a trading economy, and the railway will strengthen its standing as a logistics hub, ensuring that it is well-connected to trading partners in the region and beyond," he said. Malak said the rail network brings numerous benefits to a country and its surrounding regions, including job opportunities, road safety improvements, positive environmental impacts, decreased congestion and greater connectivity for both urban and peripheral communities. "The additional economic activity in UAE brought about by the railway means increased income for residents, business owners and property owners," he said. "This is estimated by an independent economic study to accrue benefits equivalent to a gross domestic product (GDP) increase to the UAE economy of Dh3.5 billion per annum by 2030," he said. "Furthermore, the rail network will attract additional inward investment. Any structural change to the economy that the railway would support would be additional to the benefits highlighted here and such change could lead to even further growth in employment and associated GDP than that highlighted." He said that Etihad Rail has no plans to follow public-private partnership in future or float an initial public offering to fund the project. Etihad Rail is a significant milestone in the economic development of the country and is in many ways symbolic and reflective of the unity between the Emirates and the greater GCC, he said, adding, "The same unity that our late and visionary leader Sheikh Zayed bin Sultan Al Nahyan built as the foundation of this nation". "The initial purpose of the railway is to carry granulated sulphur, which is a by-product of sour gas extraction. As Etihad Rail’s network and capabilities expand, it will certainly be able to offer tailored logistic solutions to downstream companies".